Around here we don’t feel you need an occasion to bake a cake. In fact just yesterday we made 3 full cakes, including this baby, because like…why not? 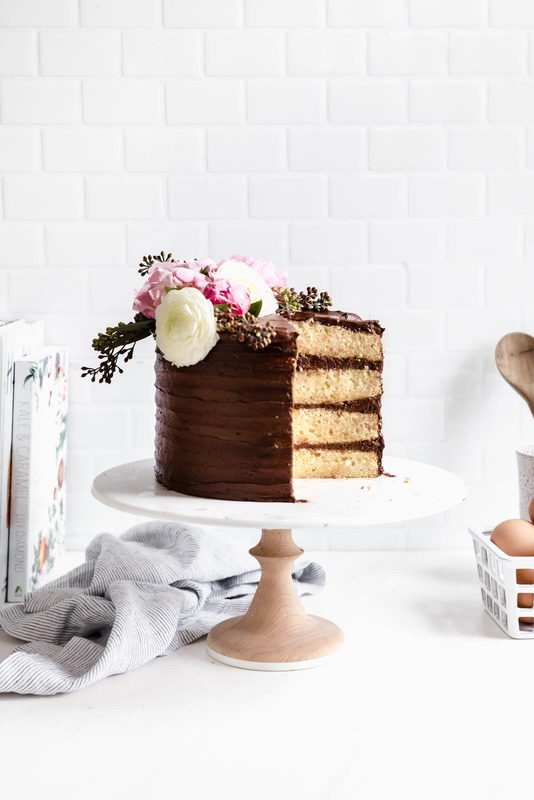 We’re embracing the cake lifestyle with this perfectly tender vanilla cake with chocolate frosting. And let me tell you, we do NOT regret the 3 cakes. Those other two cakes will be on the blog soon, but today we get to celebrate Monday with this chocolate frosted cake topped with a little peek at Spring. If you’re a vanilla cake person, you’re probably going to– nay GUARANTEED– to like this cake. 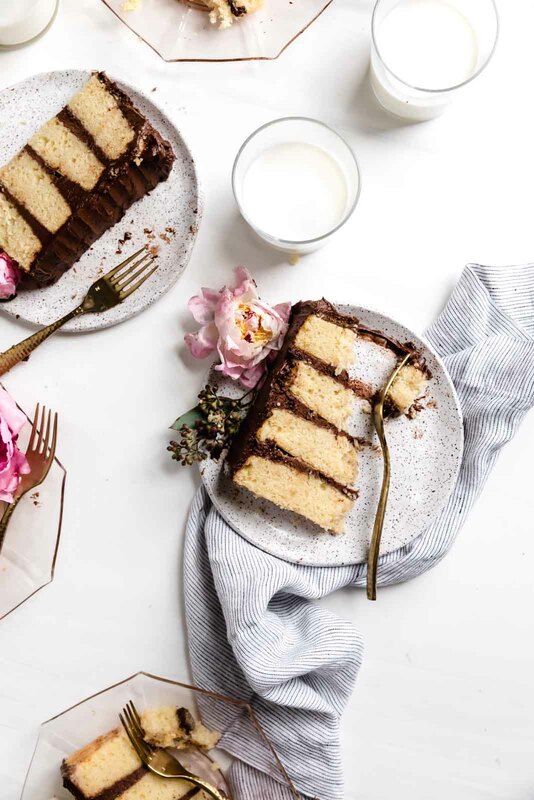 Vanilla has always been, and will always be the cake I request on my birthday and you better believe it’s going to be smothered in homemade chocolate buttercream. Duh. Okay. That was rude, Sofi. To make matters worse, I then demanded a specific cake baked by someone else, which was probably a knife to my poor mother’s heart. Especially because this cake I raved about was from Shaw’s, as in the grocery store. Clearly I had a very refined palette. 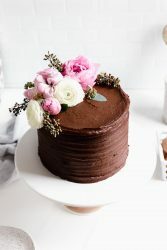 While this recipe ain’t no Shaw’s cake, this vanilla cake with chocolate buttercream is the new cake I’m asking for on my birthday this year. The combination of creamy, rich chocolate buttercream and tender vanilla cake with the perfect crumb are a match made in heaven. It’s a no brainer. How to make the best vanilla cake? Vanilla cake is notoriously hard to make. It has a long history of being labelled, “flavorless,” “dry,” “gummy,” “bready,” “or heavy.” Which pretty much describes the exact opposite of this cake which is actually flavorful, moist, tender, and fluffy. 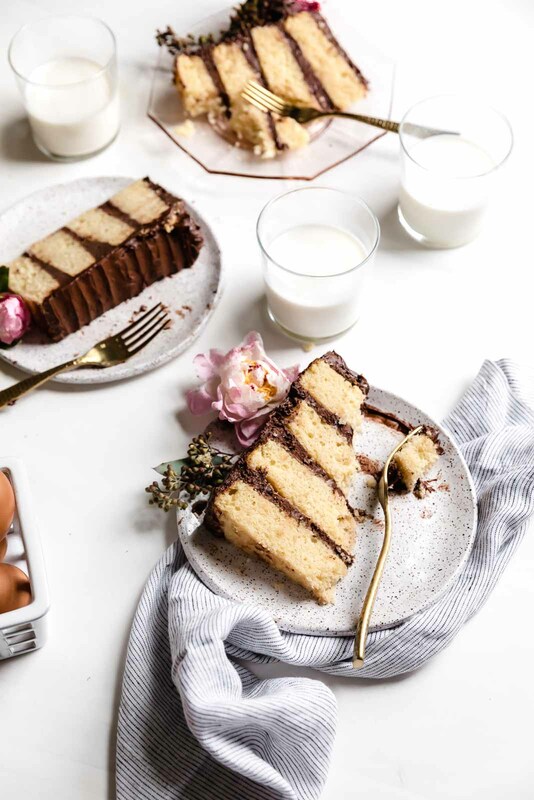 You can head on over to our vanilla cake recipe to experience the magic with your own tastebuds. You’ll find a step by step break down outlining how to make the best vanilla cake here. All you have to do is bring the butter to room temp, and follow our instructions and you’ll be golden. No pun intended. 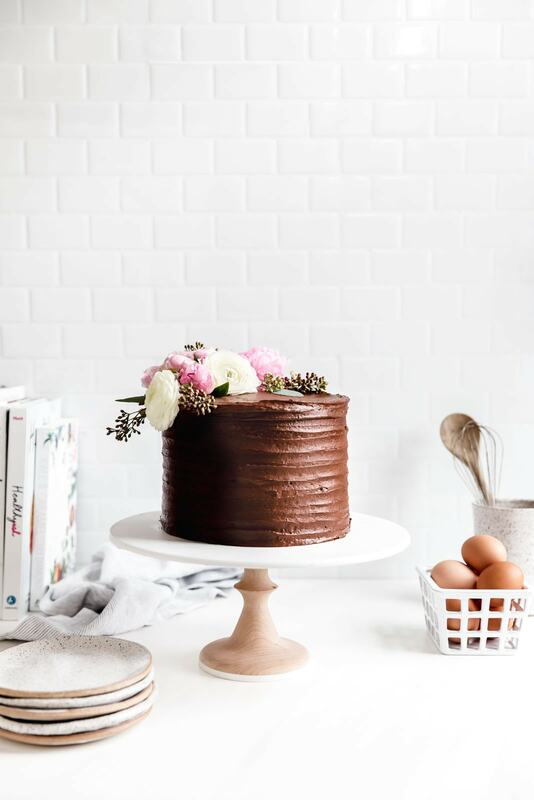 If you’re new to making homemade cakes, or frustrated by them (we’ve all been there) you’ll find this super helpful! Life is short. Don’t wait for a birthday to roll around to make cake. And while I do stand my ground on grocery store cake (don’t judge me plz), I might just prefer this vanilla cake with chocolate buttercream. You shouldn’t need an occasion to eat cake. Who’s with us? 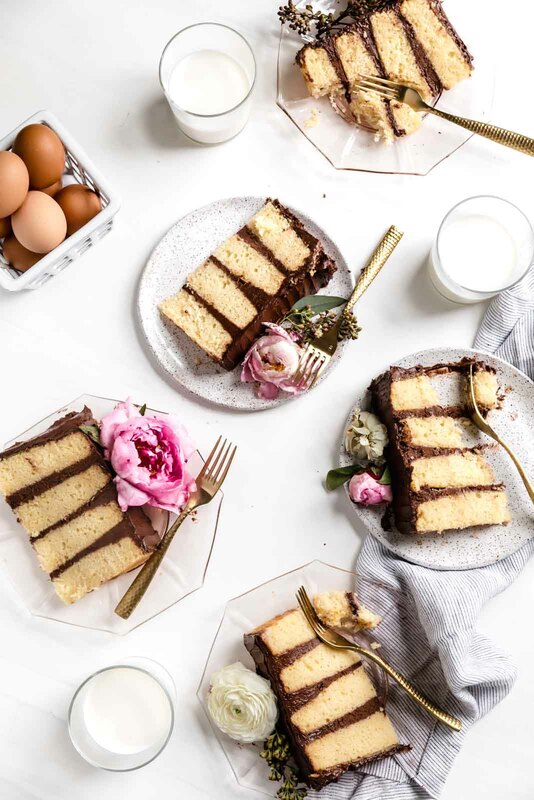 Celebrate any day with this perfect vanilla cake with chocolate frosting. Cream the butter and cocoa powder for 2-3 minutes, until the cocoa powder begins to lighten in color. Add in the powdered sugar, milk, vanilla extract, and salt, beating until light and fluffy, about 1 minute. 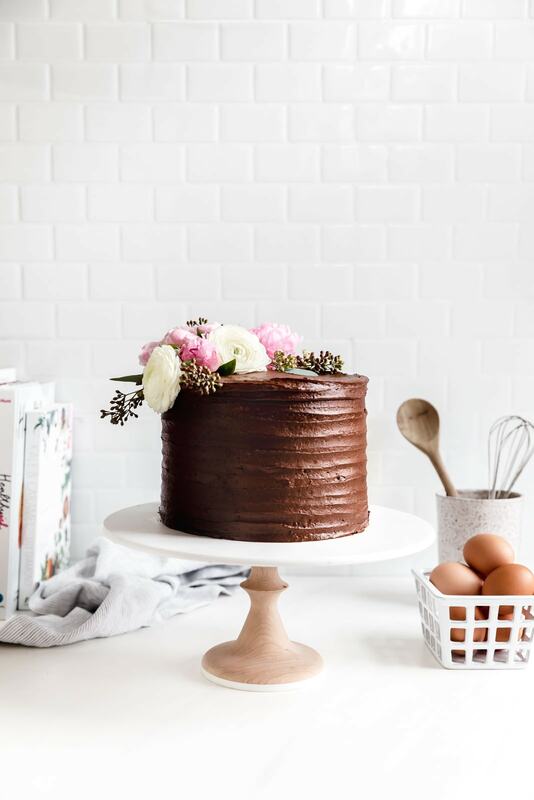 Place first cake on a cake stand, then top with generous amount of frosting. Layer second and third layers, frosting the same amount in between each. Frost edges of cake with remaining frosting. Top with flowers, sprinkles, or whatever your heart desires. Enjoy any day! *TIP: We like to freeze or refrigerate our cakes before frosting. This make the frosting process much easier and sturdier and can help prevent getting crumbs in your buttercream! 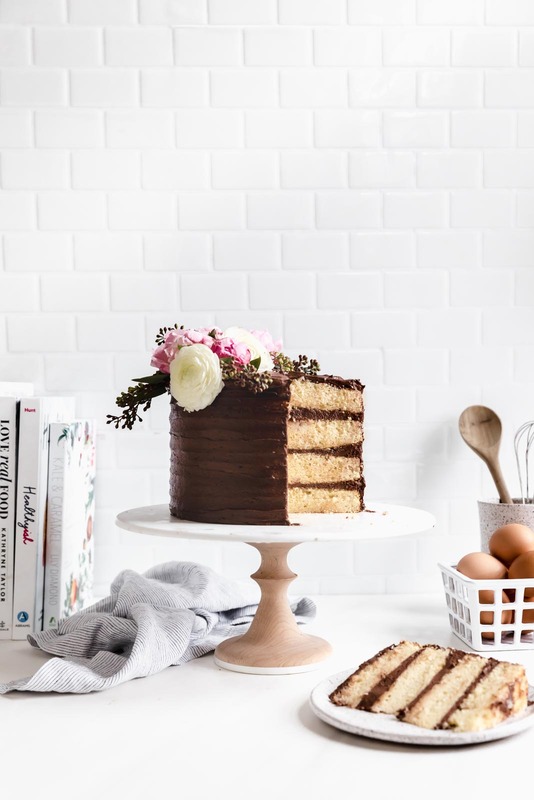 The Best Vanilla Cake with Chocolate Buttercream frosting sounds like a winner to me! 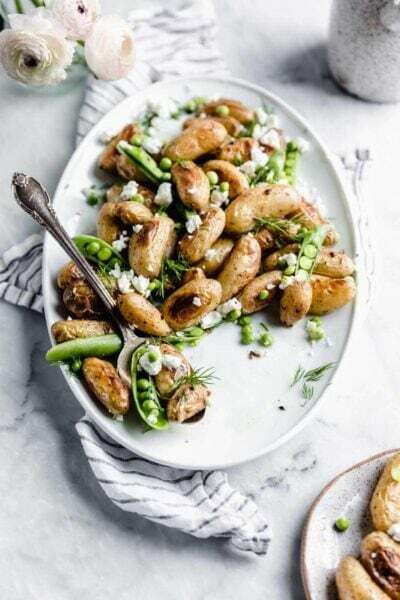 I will make this for the weekend! Looks great! But in reviewing the recipe it is for a 2 or 3 layer cake but what about for the 4 layer cake you have pictured? Hiw many inches is that and can I just double the recipe? I made this today for my brother’s birthday and from my tastes of the batter it is going to be scrumptious. Thank you for the great recipe, Sarah! Hi! If you click on the link for the “Best Vanilla Cake Ever” it will bring you to the post with the recipe for the cake! Hope this helps!